Where can you see almost a millions penguins, hundreds of sea lions, dozens of whales and even orcas, all in one place? Andean Trails’ travel expert Tom describes his trip to Argentina’s wildlife haven – Peninsula Valdes. We left the sea view balcony at our Puerto Madryn hotel, wine glasses still occupied, and strode along the pier, all the while keeping an eye at sea. It was almost 9pm and the sun was setting, and a fair few other folk had had the same idea. “Another” went the cry, “Over there!”. Breach after breach after breach – Southern Right Whales were leaping high from seemingly all parts of the sea, before crashing down into the waves. Of course, I’d forgotten my camera but the spectacle was too good to miss as these magnificent beasts splashed about sometimes only 50m from the pier. That was our introduction to Peninsula Valdes, a World Heritage status wildlife heaven. The Valdes Peninsula itself is a wildlife sanctuary and breeding area for Southern Right whales (June-Dec), southern fur seals, elephant seals and sea lions. The next day, we headed off to take a whale watching boat from Puerto Piramide. This is a sleepy seaside tourist town most of the time with a beach, a few hotels, some basic cabins for rent and a smattering of restaurants (it gets busy Christmas to February). We started at the Interpretation Centre, which boasted a panoramic view of both gulfs, Nuevo and San Jose. Once aboard, our skilful – and careful – captain sailed us up close to the whales. Mothers and calves were undisturbed by our presence. If we’d gone between July and October, a semi-submersible operates for an underwater view of the whales. As well as the whales, our guided tour took us around lookout points from which we could gaze down at penguins, sea lions and various sea birds. We also saw rheas, guanacos and maras (an oversized hare unique to Patagonia) along with a curious armadillo that posed for the camera. Most people visit Peninsula Valdes for a day or two but that is to miss out some peaceful and wonderful activities. The coast is replete with fossils, enormous shells and beautifully carved rock and silt formations. We walked, straight out of Puerto Piramides and into a wonderful unguided traverse, marvelling at rocks, shells and even teeth that protruded from the cliffs. 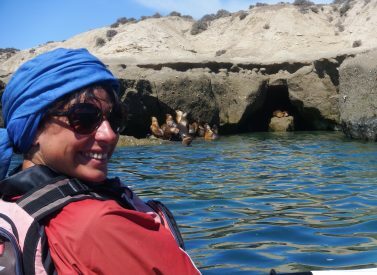 From Puerto Piramides itself there are various routes to see more sea lion and elephant seal colonies and it’s easy to while away the hours watching wildlife, completely at ease, with the crash of the Atlantic mixing with the calls of the animals. For those looking for a more up-close wildlife experience, do as we did and hop into a kayak and try a day trip (for beginners), with longer self-sufficient camping trips for confident kayakers. Inquisitive sea lions swam around our kayaks and but we had no luck on the whales front. The brave (us) enjoyed a bracing swim in the Patagonia waters, too. We finished off our trip with a visit to the wonderful El Pedral estancia. This 19th century Norman house has a truly privileged location. Penguins have started to use its private beach as a nesting ground and we got to within feet of their nests and burrows. Of course, such a large amount of wildlife brings predators. We saw sea lions chasing the penguins as the birds headed out to fish. Larger hunters also circle – including orcas (killer whales). If you can’t make it to El Pedral, then don’t forget to visit Punta Tombo, the biggest continental breeding ground of Magellan penguins. Here, you can walk along the park trails and see more than 200,000 nesting birds, and more than 600,000 penguins. We spent a week exploring Peninsula Valdes and every day was a wildlife-filled treat – I’d recommend at least four days in total including travel time, giving two full days for visits.